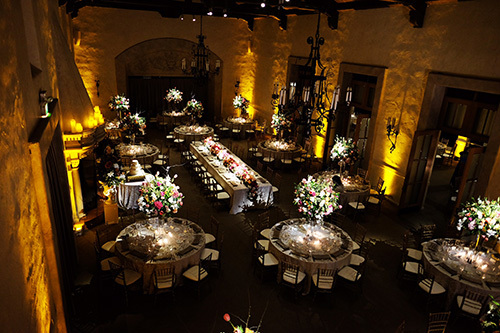 Lighting is the most effective method in transforming an event space. It allows you to take a bare meeting ballroom to an elegant wedding and event space. Or turn a basic backyard into a magical night under the stars. 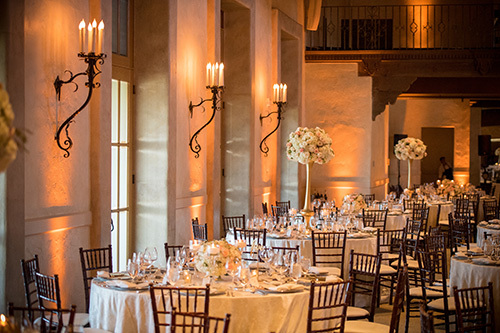 With 10 years of local experience, Chic Event Rentals staff has gained the knowledge to know what works at just about every venue on the Monterey Peninsula when it comes to adding lighting. 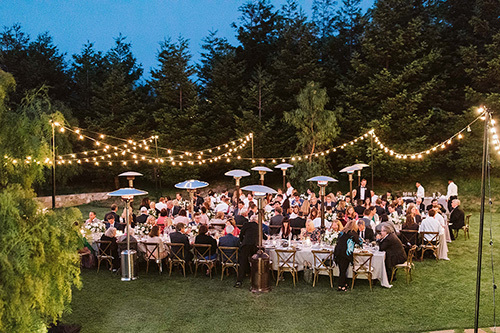 Call us today at (831) 375-1055 to speak with one of our lighting specialists to find out about adding lighting to your upcoming weddings and events! Up lighting is the most popular lighting effect. It is created by placing lighting fixtures on the floor and pointing them up. This illuminates walls, trees, ceiling, or anything the light is shining on from the bottom up, creating the "up lighting" effect. The perfect way to dramatically improve the ambience of an event space. Can be provided in virtually any color. Battery operated lights have an 8-20 hour run-time, depending on color. Have wireless DMX control capability, meaning we the colors can change throughout the event using a computer and an on-site technician. Fixture available in white or black exterior to match venue aesthetic. 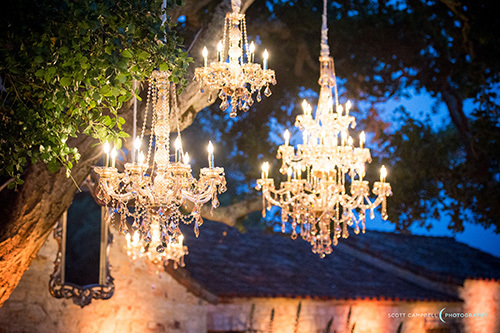 Italian string lighting is the perfect way to add a romantic ambience to any event space. Using existing structures, trees and/or rented light poles, this overhead lighting is extremely functional for lighting both small and large areas. It is also highly customizable depending on the unique event space. Bulbs are spaced 24" apart. Power is required. If available, we can use onsite power. If not, Chic Events can provide a generator for an additional fee. Can be placed on a dimmer if desired. 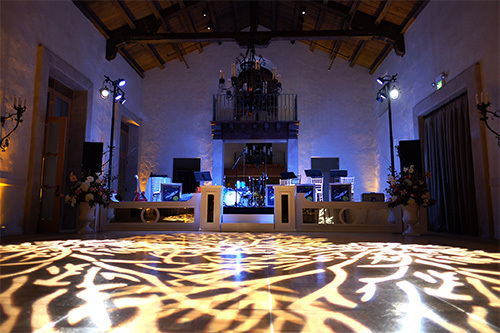 Pin spot lighting is the perfect way to illuminate key elements of your wedding or event without being overpowering. Adding pin spots overhead and turning off or dimming house lighting will add highlights and shadows in all the right places to create the perfect visual interest for your guests. We recommend adding pin spots to highlight centerpieces, bars, dessert tables, and cake tables. Ceiling mount required via magnetic mount or clamp mount. If ceiling is unusable, rented light poles are required. Includes a remote control for easy powering and dimming. For tall centerpieces, we recommend (2) pin spots in order to highlight from all sides. Chandeliers are a great way to add classic elegance, accent, and drama to any event venue or tent while also providing functional light. Can be suspended from trees to create a look of enchantment and sophistication. Rigging points required in tenting and event spaces. Can either be used with electricity or battery operated. For battery operated option – 10-hour run-time, remote controlled with dimming capabilities and reduced setup time. Non-battery powered can be used with an external dimmer. Gobos are specially designed metal or glass stencils that are placed over a light to project a design or pattern onto a wall, dance floor, tent top or any other solid surface. Gobos can be created as customized monograms, wedding dates, or company logos, or can be provided as stock textures to give an overall patterned wash. Gobos are a great way to add personalized and interesting lighting elements to your wedding or event! Glass gobos must be made if client desires two or more colors. Metal gobos only allow for the color of light (or a gelled light) to be used. Best when projected from straight across so image does not get distorted. Breakup patterns work especially well for tented receptions, where the entire tent ceiling can be used as a canvas for a large-scale pattern. Wash Lighting is an inexpensive way to add lighting to areas where light is lacking. 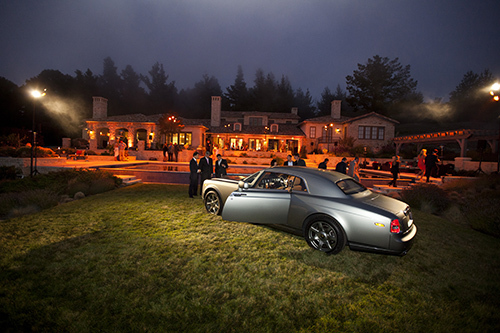 This form of lighting is popular to light long walkways outside where guests will be walking at night or to highlight a dark corner at an outdoor or indoor venue. Wash lights must be mounted as high as possible. Light poles or tent hanger kits will most likely be required. Can be used with electricity or battery operated. 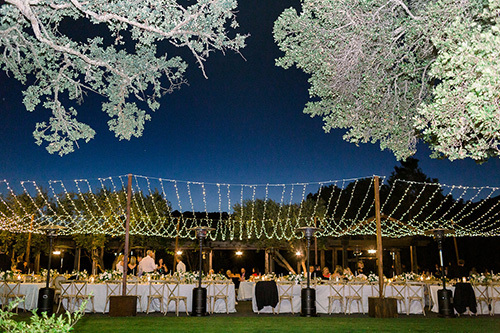 Twinkle lights are a great way to create a romantic, starry sky ambiance in any tent or outdoor space. This classic lighting also looks stunning with intertwined with ceiling drapery, wrapped around tree trunks and strung behind a sheer fabric to accent focal point walls.